This giveaway is now closed. The winner is #57 Sophia! Hi everyone! I made it to Ontario!! Of course in typical travel fashion for me it wasn’t completely without incident. If you’ve been here for any length of time you know that whenever I travel something ALWAYS goes wrong. It just doesn’t matter how organized I am, things happen that I don’t anticipate. This year my darling 12 yr old food allergic child who never goes anywhere without his Epi-pen/Benedryl pouch, forgot said pouch in the car and didn’t realize until we were through security. Anyone with a food allergic child will understand the level of anxiety I went through upon finding this out. I immediately jumped into problem-solver mode and scoured the airport stores for some Benedryl to take with us. Of course none was to be found but I did find out the airplane had some on board which made me feel better. I also wiped his entire seat down on the plane and didn’t let him eat anything except what we brought. We made it through with no problems but gosh I’m not sure I breathed the entire way. We have since been to the clinic and gotten two more Epi-pens so all is well again. I have never once had a smooth trip anywhere without any hassles no matter how prepared I think I am. Sigh. You see being organized doesn’t mean I’m perfect that is for sure. This view from our rented vacation cottage has allowed the relaxing to commence. So peaceful! So this week I’ve got another giveaway for you. This one will be open to everyone and you just have to submit a comment on this post to enter. Easy peasey. Have you heard of the menu planning service, Food on the Table? Food on the Table is an online budget meal planning service designed to help families eat better and save money. Their meal planner template combines weekly sales from your local grocery store with your family’s food preferences. What this gives you is a meal planning template that is ideal for creating a family-friendly and healthy meal plan based on kid-friendly recipes hand-picked by their chefs. 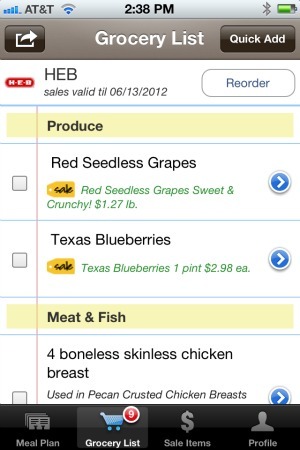 Then, they send you to the store with a printable grocery list that can also be viewed on your smartphone. First, you select your local grocery store. 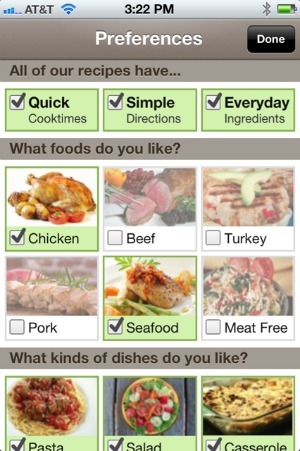 Then, you tap off your food preferences, even including dietary restrictions like Gluten Free, Low Carb, and Low Fat. Then, they recommend recipes based on those preferences and the sales at your store. Add those meals to your plan and the items go to the grocery list, showing you exactly what’s on sale. There is also a tab dedicated to all the sales in the grocery store. Food on the Table is free to plan three meals per week. If you want to plan more, you will need to upgrade to premium. Today, we’re giving away a year of premium for free, plus a $25 gift card at your favorite grocery store. Simply leave a comment on this post, prior to July 20, 2012 at 6:00 pm PST, to enter for your chance to win. Open to everyone however please know the stores won’t be applicable to your area if you are outside the US. They do hope to expand internationally in the next few years. Also find Food on the Table on Facebook. Wow, looks so relaxing – have a wonderful time! Things are hopping this morning – tough getting on the site! 😉 Thanks for all you do- MPM really helps keep me on track. The planning service sounds great. I love that they have GF options and use local sales. How smart! Your vacation spot looks beautiful, hope you have a fabulous vacation and thanks for hosting! Sheesh! What a trip. As an allergic-one myself, I can only imagine the stress. I’m so glad that you made it without incident; and hope that scenery induces calm and quiet! Very interesting site. I think that could actually be useful for us, we’re terrible at meal planning and wish we did more, but this might help keep us on track. Thanks! I will be looking forward to trying this site to see of it works for us. Thanks! Just found your blog and love it! Plus, meal planning support is right up our alley. Thanks! Wow, that app looks awesome! Definitely trying it out. Wow…that app looks too good to be true. I like that you can try it out 3 days a week for free, that it is healthy, that it can customize to your local grocery store. Looking it up now. Your vacation view is awesome! I’ve always wondered how meal planning services work. It would be fun to win and give it a try! I’m familiar with Food on the Table already – and it would be AWESOME to have a paid subscription! 🙂 Thanks Laura! Awesome giveaway!! I am a firm believer in meal planning and this site sounds great. I have never heard of it before. I always look for the sales and then make my menu. This sounds like it will do it all for me. AWESOME!!! Thanks for the new app! I had not heard of this one yet. I am a firm believer of scheduling the meals for the week. It gives us so much more family time! Thanks again! sounds like a great app! sorry to hear about your plane ride stress. Love the app idea! Have a great trip! I will be vacationing the last weekend in July. We are going to Orlando. I am soo excited. Hope your trip goes better than the travel. We have a timeshare and I plan all our meals when we vacation and it saves us tons, and I also try to do at least one fun recipe for the kids to try. This food planning site sounds great. Would love to win! Just found your blog and I’m sure I will become a regular reader. Enjoy your vacation! This sounds like a great site and can’t wait to try it. Have a great trip! Love the app – will have to try it! Just downloaded the app – sounds like perfection to me! Meal planning gets difficult! This is such a fantastic idea. I love planning menus for the week but hate the hassle of seeing what is on sale where. Thanks for hosting this giveaway! Sorry about the plane ride stress. Glad you made it fine. Looks like a wonderful place to relax! I love Menu Plan Monday! Thanks for the application, will definitely try it out! So much easier than searching the fliers. Thanks for this app. I am struggling with a gluten/grain free,dairy free diet and this sounds like it’s made for me. It literally takes me 2 days to plan and put together a meal plan for the week. Especially one that does not break the bank. Maybe this will take some the the “stress and frustration” out – thus making my dh’s life easier. I love this idea – simplify my life! ummm….you’re on vacation, so you should be relaxing with your family, not adding to your blog especially with a really cool tool for all of us. Relax, we will be here when you get back and refreshed! Love the idea of getting some help with food planning! I’ve lost 70 lbs and have 30 more to go. I am looking forward to using the site to help with the rest of the weight. I’ve gotten better about meal planning, but I love the thought of someone doing it for me! I’ve looked at Food on the Table before, and it does look interesting. Thanks for the giveaway, and for the link party every week! Food on the Table is such a great idea for keeping costs down. Just downloaded the free app. Can’t wait to try it. I have been looking for something like this. Thank you sooo much! Looks like a good idea….I’m always looking for new things to feed the kids. They have their favorites, but the adults get tired of the same things. Wow, I bet that was scary. I am glad that it all went okay and all is well now. Enjoy your vacation. Thanks for hosting such a great give-a-way. Food on the Table sounds like a great resource! Enjoy your vacation. I found this very helpful since I need to plan ahead more and since my kid has dietary restrictions this is what I needed and more. Thanks so much. Hi! I would love this app! it would be perfect for us we just got married and this is the app I’ve been looking for to be thrifty! Please please please! It would make our life so much easier and would make us really happy too! Thank you!!!! I left a post that doesn’t exactly fit the menu theme and I hope that’s ok. My link is Weed Free Garden Tip #145. Since it’s info about efficient gardening I thought your site would be a good place to post it. It makes me sad when people forego vegetable gardening because of all the weeding and watering work. I hope to show readers that gardening can be relatively carefree once the garden is planted. I am incredibly amazed by that view. It’s like being on vacation just to look at it. Aaaaah! Now, back to our regularly-scheduled day. This looks interesting. Thanks for the giveaway, I’d love to win. I love your site and have been using it to help keep my fam and I on track! This service looks super fab. I am def going to try this out! I really need to get back to meal planning. Winning this would be awesome! I have been trying to start menu planning…in fact I’m trying this week…again. I would love to have a chance to win!! I am going to try this free version. I am constently on the interent searching for healthy “clean” foods for my family. This healthy eating is new to me so it has been somewhat of a challenge. I am 23 weeks pregnant with baby #3 and it has hit me hard how important healthy meal planning is. Thanks for the info! What a great app!!! I old love something to do the planning for me! I’ve tried the website and love it, but would love to upgrade to the premium membership and who wouldn’t love extra grocery money! Thanks! Sounds like a great app! Would love to try the premium membership. What a great app! I think this would really help a lot of families. Enjoy your trip! We too can’t seem to go on any trip without some snag in the plans a well. What a wonderful idea! Can’t wait to try it. 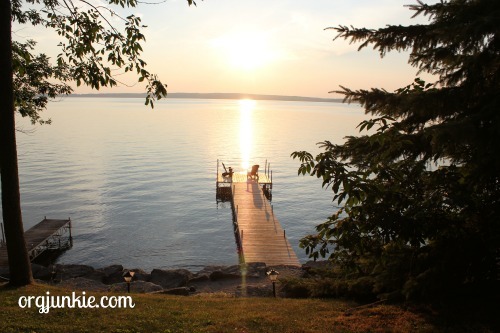 I would love to be at your vacation spot – it looks perfect! I would love to win the menu planning – have a house of 4 adults and one child and it is getting harder to find something that everyone likes. Thanks for hosting this link up and the giveaway of course! Menu planning is such a huge help to me. I love reading what other people make too. I need to get back to menu planning and stop this summer slide! Glad to hear you were able to get another Epi-pen with no problem and with the view from your cabin, you should be relaxing in no time!! Hope to win the Premium Food On The Table!! The app really looks great. Enjoy your vacation! App looks interesting. I am going to have to check it out. I HATE planning meals!! Enjoy your trip and the meal planning service sounds great! I recently found Food on the Table, and I love it! I only have the trial version, but the recipes are great and it’s very user friendly. I love that it makes my shopping list for me as I go along. Anyway, I hope you enjoy that gorgeous view as you recover from the airport mishap! I have been trying to actually start planning meals for my family. This app/website sounds like it would make it so much easier. That meal planning app sounds fabulous! I hope it has lactose free options as well! That’s my biggest dilemma. We’re excited to be participating in the giveaway! We can’t wait to meet the winner. I use this site and would love the upgrade! thanks for the chance to win! Enjoy your vacation! Menu planning would simplify my week! Fingers crossed! Thanks for the opportunity! I am really struggling with being a new diabetic and trying to figure it all out – thanks again. I never have incident free traveling either. I can’t wait to check out the app. Sounds great. Def need this meal planning site in my life!!! I never heard of food on the table before but it looks awesome! I love the recipes on Food on the table. With that beautiful view you can put all hassles behind you. Have a glorious time and I will pray you have no more mishaps large or small. The Food on the table app is very professional. I will subscribe to the free service for now to check it out. Thanks. I’ve looked into Food on the Table a couple of times. I’ll have to look into them with some more detail. Thanks for the giveaway! What a great idea. I am going to have to check this out! have a terrific vacation, and what a great planner! This is my first time to your site but I have a feeling I will be back. I love the little bit I have seen! 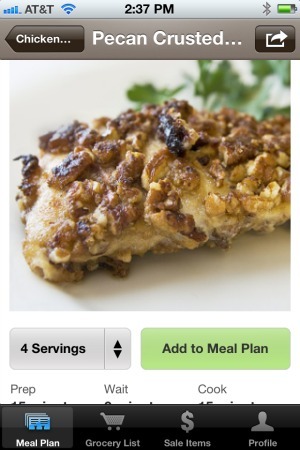 Wow…love that this meal planning site actually has my grocery store that I use! Gonna try this out for sure! Wow, so glad your travel went well! Hoping to get some menu ideas cause this week my mind is blank. 🙂 had grilled chicken and a taco casserole so far. Can’t wait to try the free version! Glad your trip ended better than it started. Thanks for sharing your great meal ideas! Going to try the free version right now!! Look handy am going to try the free version ! Cool thanks!!! Looking up ASAP! I have been looking for something to compliment my Weight Watchers meal planning…this may be the right fit!! What a cool idea for an app!!! what a great idea! i’m constantly going between written lists and iphone notes at the store. can’t wait to try this app. What an awesome site! I’ll have to try it out! That would be awesome to try! That app sounds amazing! Wish I would have known about it before but definitely going to check it out now. I’m a stay at home mother with a 9 month old so any penny we can save is great. Thanks for the tips and recipe ideas. Have fun on your trip! Looks like a great app! I would love to win!! I need a menu planning helper. I can spend $150 at the store and have nothing to make a meal out of. This site looks awesome for us visual types. First time here and I already LOVE your ideas. Menu planning is hard for me… three picky children and I always feel like I’m making more than one meal at dinner time… Thanks for the great advice! Going to give it a try! I love that is has a dietary restriction area for the planning of meals. I am excited to try this out. I had never heard of “Food on the Table” loved it. Easy recipes, great layout. I so want to get back to planning my dinner menus! I was doing this regularly, then life circumstances and health interrupted and I’ve been out of the practice for far too long. I can tell such a differnce – much more chaotic to not have any idea what’s for dinner! Have a wonderful, relaxing holiday, Laura! Yikes to the forgotten epi-pen. Glad everything went okay without it. I’ve never heard of this menu planning service. It sounds awesome. Who doesn’t need help with meal planning. I’m heading over to the site right now. Thanks for sharing. What an awesome prize to win! Gah- meal planning! What I always say I’m going to start doing and never manage to tackle. :/ this looks like an awesome service and a great giveaway! Thanks for having such an great site! Wow! So cool. I have the Epicurious App which I love, but this sounds amazing!! Thanks for posting about Food on the Table. I’ve been researching meal planning sites tonight, trying to knock down our grocery budget a bit more and came across your post!!! Just came upon this site looking for ways to curb spending. Lots of wonderful ideas, thank you! My husband and I work hard to plan weekly menus and shop accordingly; however, I don’t do well incorporating sales from my grocery store. I would love to access the features of Food on the Table to do this. Thank you for offering this giveaway! Ive been needing help with meal planning and trying to save money… just what I needed! Im a brand new farmers wife and this drought is making me a little worried for the year to come so time to start penny pinching! What a neat idea, I would love to try this out! I think it would help us save money and be organized!